The Garda Hitch is one of many ways folks have used to suspend their hammock. It was adopted from climbers who use this as a simple “pulley/ratcheting” system to haul gear up and not slip. The Garda Hitch isn’t without its distractors, however. Some folks have worried about the pinching process weakening the cord over time, leading to cord failure. To play devils advocate, any suspension system for a hammock is prone to wear over time, so no matter what technique or system you use should aways be inspected for wear and abuse. Those who hang often may need to replace their suspension every season. Climbers, for example, are especially conscious about wear and systematically replace ropes just to play it safe. There isn’t a lot of documentation on breaking strength and load strain using the Garda Hitch. In truth, I don’t think it was ever envisioned that this hitch would be used to hold human weight. I asked a buddy of mine, David of Canny Designs (creator of the Loop Alien) if he would mind using his tools to do a fail test on the Garda Hitch. The Garda Hitch held fast and worked well for a load under 400 lbs (181.4 kg) before slipping. Above this limit, the Amsteel began compressing and stretching, and slowly slipping, but it never failed. Failure occurred with the aluminum rings! In certain circumstances, the Garda Hitch works well for hammocks. I would recommend it for hangers less than 250 lbs (113.4 kg) who are interested in this quick-adjusting system. 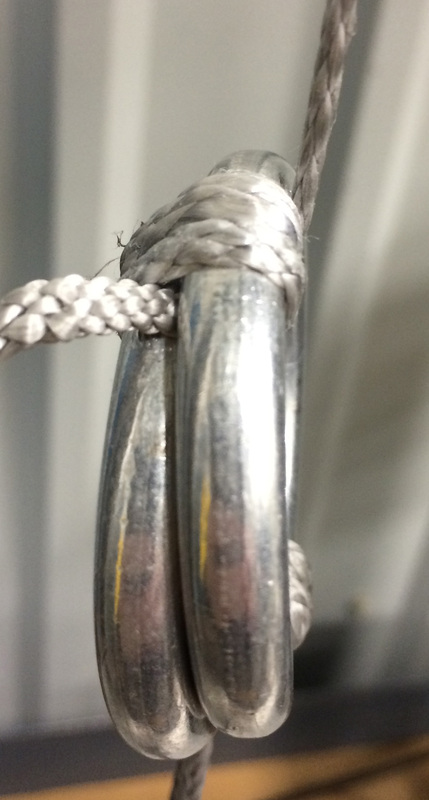 The rings were anchored with a looped length of 1/8 amsteel (back woven fig 8 knot). The hammock side was 7/64 Amsteel. 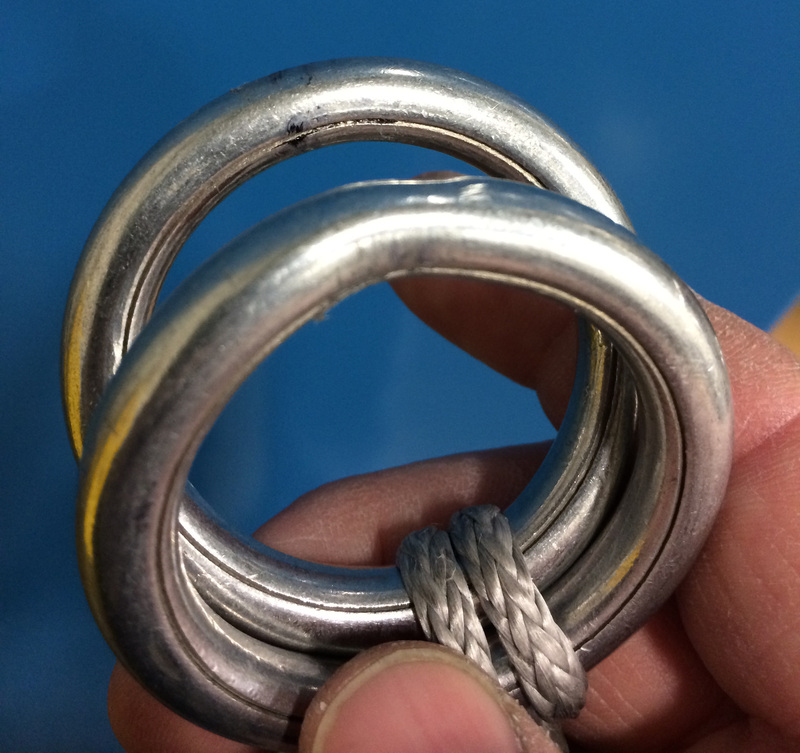 Rings were seamless aluminum SMC descender rings. 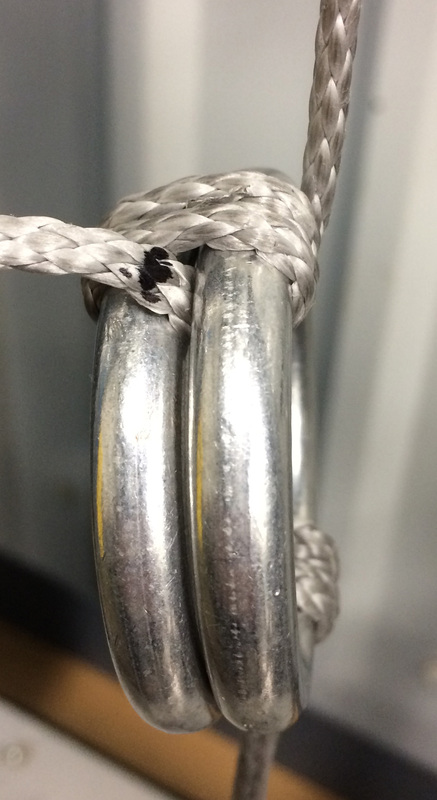 The black mark on the rope in image 7 is from a marker. When I ended the test, that mark was exiting the rings all together but the system was still holding some tension. In images 5 and 10 you can see how the rings became misaligned allowing the rope to slip. Notice how the outer weave of the Amsteel was bunched up and the tail entry point. 7/64 Amsteel started intermittently slipping around 2000n (449 lbs). Max 2608n (586 lbs) at this point the rings had separated enough that the rope just continued to slowly slip. Rope stretches on the 1st bend of the hammock side rope (see image10) some broken fibers can be seen. 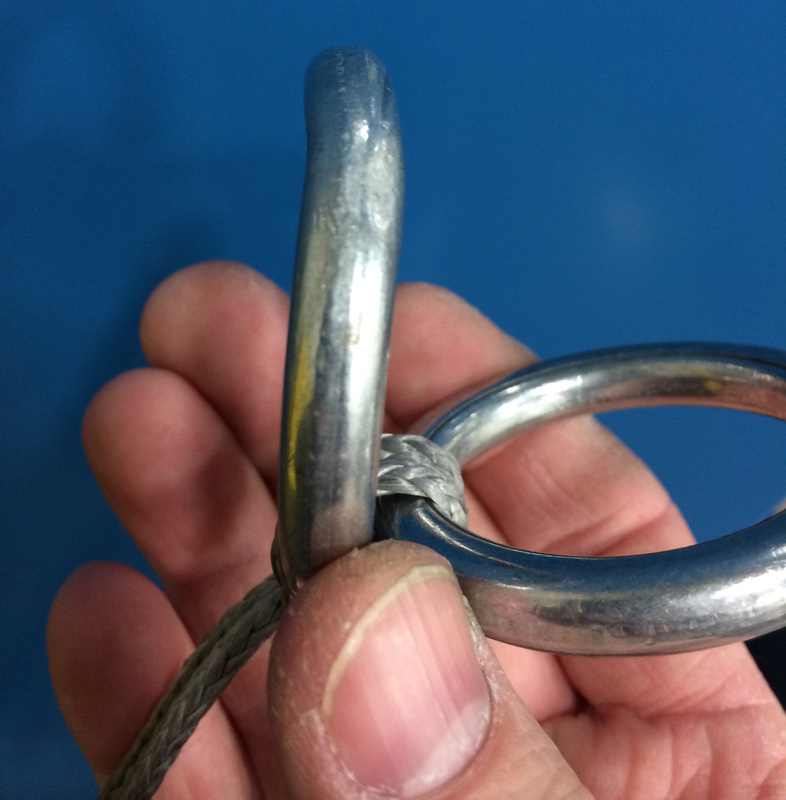 if you use aluminum ‘rap rings’ (rappell rings) you won’t have this problem. they’re rated to 250Kn (about 2 tonnes). if you get the HomeDepot rings, then, yeah: problems all over. i’m 185cm and 133kg. my Hennessey has worked flawlessly with them down to -5°C. Thanks Ian. I agree with you. I use the Omega-Pacific rings which have a larger diameter than the SMC rings. This provides more surface area to spread the compression. I saw a youtube video showing the compression effects on 7/64 Amsteel with the SMC rings and the effect was clearly evident. For that reason I also use 1/8 Amsteel for my suspension lines with the rings at the tree. It makes for great ease in making strap adjustments. I am willing to pay for the slight extra weight of the rings and line for the convenience. 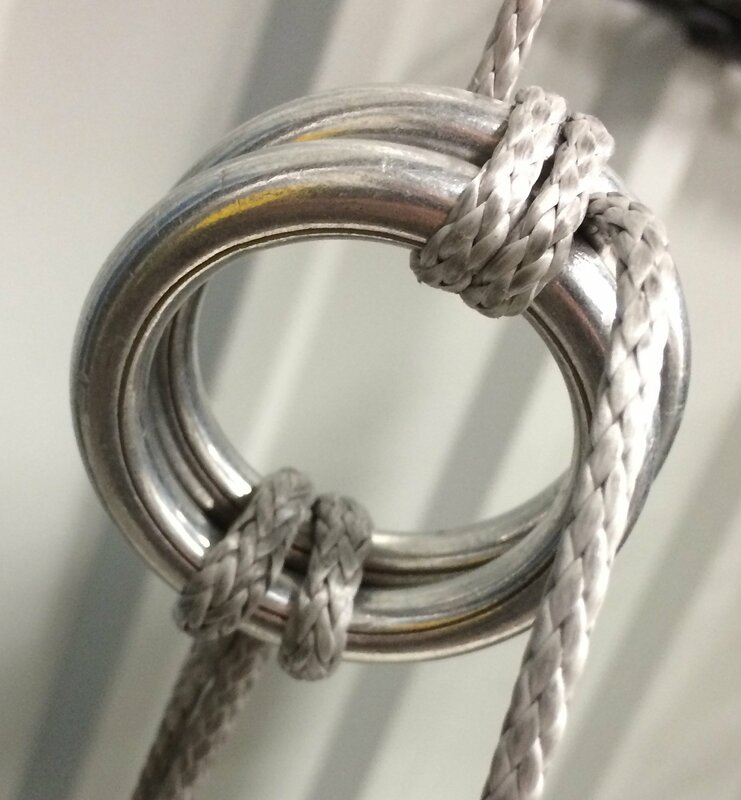 The Omega-Pacific rings are much thicker than the SMC ones….hence the offer more surface area to the rope used. Will the Garda Hitch work on rope like the one that comes with the Hennessy Expedition? Yes. I use it myself. The thicker ropes work great without much else. Hennessy models that use the smaller diameter spectra line should be tied with a double becket hitch. Just a helpful hint: “distractors” should be “detractors”. As far as concerns about the hitch itself, I think the main concern is not immediate failure due to compression, but its effects on the longevity of the cordage; Dutch of dutchwaregear actually pulled a product (speed hooks) because it compressed the suspension, causing a weak point that failed at a much lower tension than expected during testing, indicating a high degree of wear over a short period of time.